I’ve been studying and writing about the human subjective experience of consciousness for more than twenty years and have accumulated a fair amount of thoughts and ideas about it. 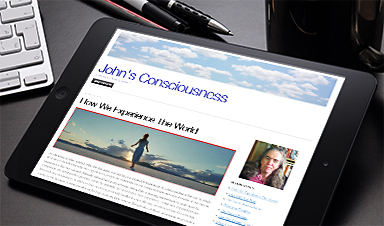 My blog on WordPress.com is called, “John’s Consciousness,” but it is more clearly about the universal subjective experience of human consciousness, and addresses how I have come to understand it as a spiritual, as well as temporal or natural phenomenon. Through a collection of a variety of personal reflections and a number of detailed reports of my own experiences, and years of research and contemplation of our cognitive capacities and astonishing neuroscientific discoveries, the human spirit now seems to me to be an essential component of human consciousness, and suggests that consciousness may be a fundamental feature of the universe, infusing everything that exists within it. I invite you to explore along with me and to share in the journey of discovery with me.